If you have any allergies, dietary requirements or dislikes, please state these on the Contact Form. Sugar, salt and fat are used sparingly but not at the expense of flavour or taste! MSG is never used. Anyone who has sampled Peter or Sally’s cooking in England will know what a treat is in store for them. 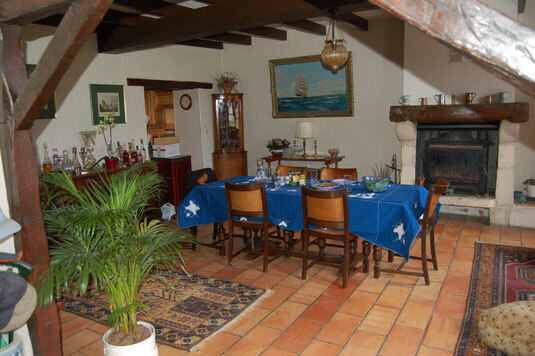 With a background of army life and years of living in the Far East, plus a love of seafood and outdoor eating; the Charente Maritime region of France provides them with all the ingredients for memorable meals. Meals are served in the elegant dining room on colder days in winter, on the terrace at the front of the house or by the pool. If you are staying in our guest rooms or the self-catering accommodation and would like to dine with us, please let us know by 10 o’clock that morning. Sally provides essentially french cooking, using seasonal fresh fruit and vegetables from the garden. Fresh fish, meat and other produce is sourced from local markets and suppliers. Local Charentais wine is served with the meal. Should you require more, this can be provided at an additional cost. Here are some of the dishes you may be served …..
Cook your thinly sliced meat, fish or prawns in a pot of plain or spicy stock then flavour with soy sauce and chilli sauce (if liked) Served with Peter’s special fried rice. We also serve steak on stone, curries and other south east asian dishes. We do not normally serve lunch but can provide a picnic, if arranged the day before.